Tenzin Phuntsok Rinpoche with Lama Zopa Rinpoche, Kopan Monastery, Nepal, June 2011. Gomo Tulku Releases His First Single – July 28! Lama Zopa Rinpoche’s health continues to improve in Nepal where Rinpoche is undertaking physiotherapy and was receiving acupuncture. 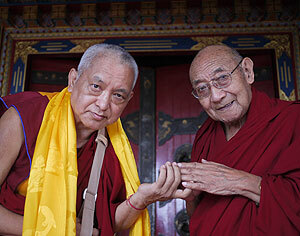 This time is quite critical for Rinpoche to regain his health. As you know, Rinpoche’s schedule for the rest of the year has been canceled and we are requesting people to offer Rinpoche the space and time over the next several months for his rehabilitation. Thank you all for your support and prayers. We will continue to post any updates and news on Rinpoche’s Health – Official Updates and Practices. Khenrinpoche Lama Lhundrup with Lama Zopa Rinpoche, Kopan Monastery, Nepal, June 2011.
physiotherapist. “Ants! I will tread on the ants.” So starts the debate between Rinpoche and Rinpoche’s Nepalese physiotherapist, Rajesh: Rajesh doesn’t understand why Rinpoche is so concerned about the ants and treading on one or two of them while he is doing his exercises. Rinpoche gives a brief explanation on compassion. Rajesh accepts. We gently remove the ants and Rinpoche continues to do his exercises. Lama Zopa Rinpoche recently composed a new dedication prayer, Remembering the Kindness of His Holiness the Dalai Lama and the Tibetan People, which was offered directly to His Holiness in Australia (since then, Rinpoche has added some more verses). Rinpoche would like this prayer used throughout the organization. The prayer should be done following the Prayer that Spontaneously Fulfills All Wishes (tong nyi nying je ….) at the end of dedication prayers. Rinpoche’s prayer is freely available on Advice from Lama Zopa Rinpoche and through the Foundation Store. A few days before his stroke, Lama Zopa Rinpoche spent a long time explaining how to make the tiny boats that now float now around at Atisha Center in Bendigo, Australia. Each boat is rigged up with different animals holding up a message, mantra and image of a buddha so that the insects who float on the water get liberated by passing these boats. 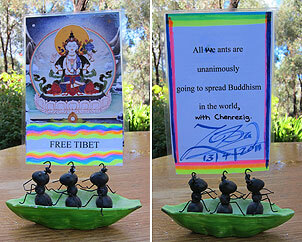 Watch Rinpoche with Ants for a Free Tibet – plus other new videos of Rinpoche. Lama Zopa Rinpoche made many offerings on Saka Dawa including offering money to well over 10,000 Sangha of the great monasteries Sera, Ganden, Drepung; all the Sangha at Kopan Monastery and Nunnery, Drepung Nunnery, Namgyal Monastery and Trulshik Rinpoche’s monastery; as well as making offerings to Druptob Rinpoche and Sangha at his monastery doing nyung näs; Serkong Tsenshab Rinpoche, Serkong Dorje Chang, Zong Rinpoche, as well as all of Rinpoche’s gurus and the FPMT Sangha communities around the world. Rinpoche also partially sponsored the annual 100,000 Tsog Offerings puja offered in Nepal in front of the Bouddha Stupa. This year Rinpoche was unable to attend but the puja was presided over by Khadro-la and Dagri Rinpoche. Rinpoche also offered US$100,000 to the building of Kachoe Ghakyil Nunnery. Rinpoche additionally offered US$20,000 to His Holiness the Dalai Lama when His Holiness was presented with the new prayer that Rinpoche had composed, Remembering the Kindness of His Holiness the Dalai Lama and the Tibetan People. Rinpoche also recently pledged a US$100,000 offering to Rachen Nunnery and Mu Monastery in Tsum; US$3,000 towards a 16-story-high stupa for Chobgye Trichen Rinpoche being built in Nepal; US$200,000 for the building of a small temple in China that is dedicated to preserving the tradition of the Fifth Dalai Lama; and US$20,000 to Lawudo Gompa for the gilding of three Guru Rinpoche statues (one is 11 feet tall and the other two are life size). Lama Zopa Rinpoche with Dhakpa Rinpoche, Kopan Monastery, Nepal, June 2011. Photo by Ven Roger Kunsang. This month FPMT was able to send the second contribution for 2011 to the Sera Je Food Fund, covering the next six months of food for about 2,600 monks currently studying at Sera Je. On May 18, 2011 we received a letter from the abbot of Sera Je, Khen Rinpoche Archarya Geshe Lobsang Palden, who had arranged for prayers to be done by all the monks of Sera Je during the month of Saka Dawa (when the merit is multiplied up to 100 million times). These prayers are dedicated to all the kind sponsors and supporters of the Sera Je Food Fund. Sincere thanks to everyone who responded to the Sera Je Food Fund appeal sent out earlier this year! We received over a third of what’s needed for the year – this was excellent. Thank you to all the kind benefactors who support this amazing project and please rejoice in this incredible offering that we are able to make to the Sangha, FPMT centers’ future resident geshes and to the “pores of the guru,” that is, the many disciples of His Holiness the Dalai Lama. We would especially like to thank the students of Cham Tse Ling, Amitabha Buddhist Centre, Root Institute, Losang Dragpa Centre and Yeshe Norbu Appello per il Tibet for their continual, generous support. Without all of you this incredible offering would not be possible. Thank you so much! Rinpoche bought 60 of 120 yaks that were going to be killed in Rowaling, Nepal. These yaks used to graze at high altitude with the nomads, but the children of nomads no longer have any interest in taking care of the yaks, and the old nomads are now unable to care for them. The yaks were being sold very cheaply to butchers. Some of the villagers at Rowaling came up with an idea to save the 120 yaks (the other 60 yaks were sponsored by students in Singapore and Malaysia), and then these saved yaks would be taken care of by families in the area. Recently in Kopan Rinpoche blessed 120 giant blessing “strings” (large pieces of cloth) that the yaks will wear. ¡Nuevo! VC Módulo 02 – Extraer la esencia, el segundo módulo de Vivir el camino. Amitabha Buddhist Centre, Singapore has started their second round of Basic Program with 228 students attending! Now that is really worth rejoicing about! 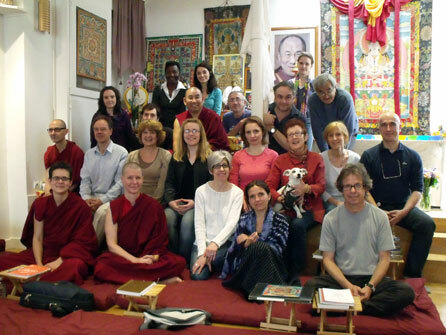 Centre Kalachakra and Institut Vajra Yogini in France will start their second round of Basic Program in September. Well facilitated reviews will prepare their first-round students for their final exam in December. Students from France will review for their final Basic Program exam in December. Most Secret Hayagriva Daily Practice is now available in booklet and e-book formats. This practice does not require empowerment. Rituals and Procedures for Commencing Retreat is available in booklet and e-book formats. Based on teachings and texts by Lama Yeshe, Pabongkha Rinpoche and Jampa Tenzin Trinlay Gyatso, these concise instructions can be used for starting any retreat. The concise document for Filling and Blessing Stupas and Statues is now available in booklet and e-book formats. Conseils concernant les maîtres spirituels est maintenant disponible. The full-length and summary reports of Taking up the Challenge of Translating Buddhism, FPMT’s first translation conference, are freely available online. Congratulations to our 2010 International Merit Box grant recipients! Awards were announced on June 2 and we were thrilled to be able to grant funds to 17 different projects. This would not have been possible without the effort and generosity of our International Merit Box coordinators and practitioners around the world. Thank you all! For 23 years, Mandala has served as one of FPMT’s main communication vehicles, bringing timely stories, articles and teachings to FPMT students worldwide. Mandala‘s website, fpmt.org/mandala, houses an extensive archive of Mandala‘s past published articles, beginning with the newspaper version of 1988-1990, Blissful Rays of the Mandala in the Service of Others. Additionally, the website features daily additions to our blogs, drawing from previously published articles from the archive and new content alike. You can subscribe via RSS (Real Simple Syndication) to all that the website has to offer, and now, through the magic of Google Translate, you can access all the website has to offer in over 20 languages! Please also follow us on Facebook for daily posts from our website, print publication and eZine. Rinpoche’s key advice about practice, holy objects, logos and general advice for centers, projects and services (and study groups) can now be found all in one place in the FPMT Affiliates Area! As recently announced via the CPMT e-group, FPMT’s Ninth International Sangha Day can be celebrated on the auspicious holy day of August 3, 2011. This is also the perfect day to make your center, project or service’s annual donation to the Lama Yeshe Sangha Fund via the donations page in the FPMT Affiliates Area. On July 10th, Khenrinpoche Lama Lhundrup resigned as Abbot of Kopan Monastery, Nepal after many many years of deep, inspiring, wonderful service to Lama Yeshe and Lama Zopa Rinpoche. 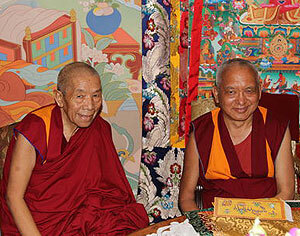 Lama Zopa Rinpoche appointed Geshe Chonyi, who began his life as a monk at Kopan, as the new abbot. Khenrinpoche Geshe Chonyi will maintain his responsibilities as resident teacher at Amitabha Buddhist Centre, Singapore, alongside his new responsibilities at Kopan – with the help of a senior Kopan Sangha team. Osel (the incarnation of Lama Yeshe) was in Kopan Monastery for the occasion and gave a talk. 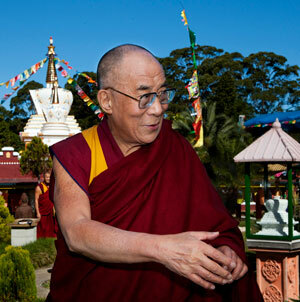 His Holiness the Dalai Lama in Chenrezig Institute’s Garden of Enlightenment, June 2011. “It was just an amazing day … we have been overwhelmed with messages from all sorts of people who attended. It appeared to all of them that the event was tremendously organized and everything went smoothly! A slideshow of photos from this amazing event is already up for all to enjoy! Thanks to everyone’s generous donations, FPMT was able to offer a wonderful total of AUD$17,869 to His Holiness – who immediately offered it back to Chenrezig Institute. Students at Vajrapani Institute, USA composed a song in honor of His Holiness’ birthday. It’s very sweet. You can enjoy it on now on YouTube. His Holiness the Dalai Lama’s teachings and public talk in Toulouse, France will be available live on the web in French, English, German, Spanish, Italian, Portuguese, Vietnamese, Chinese, Russian and Tibetan. His Holiness will teach on Kamalashila’s Stages of Meditation, Volume II on August 13 and August 14, morning and afternoon. He will give a public talk on “The Art of Happiness” on August 15. Many congratulations to all who have served Buddha House over the years to enable the center to keep benefiting sentient beings. Gomo Tulku, born in Montreal, Canada in 1988 and recognized at the age of three by His Holiness the Dalai Lama as the 23rd Gomo Tulku, releases his debut single July 28. The 22nd and 23rd Gomo Tulkus have strong connections with FPMT and Italy. In fact, the present Gomo Tulku has lived in Pomaia at Istituto Lama Tzong Khapa and in Milan where he has worked with famous Italian hip-hop producer Deleterio. Gomo Tulku also has gained sponsorship from Guess clothing line and has generated an international media buzz. Gomo Tulku’s sound is a mix of hip-hop, R&B, dance and pop and it is sure to get noticed! Mandala recently interviewed Gomo Tulku (and other young FPMT notables) for the October-December 2010 issue. The article is freely available online. Work-study opportunities are offered by Chenrezig Institute, Australia; Jamyang Buddhist Centre, UK; Nalanda Monastery, France; O.Sel.Ling Centro de Retiros, Spain; Milarepa Center and Vajrapani Institute, USA. Kalachakra Centre in France is looking for a manager-cook for its retreat facility in Normandy.